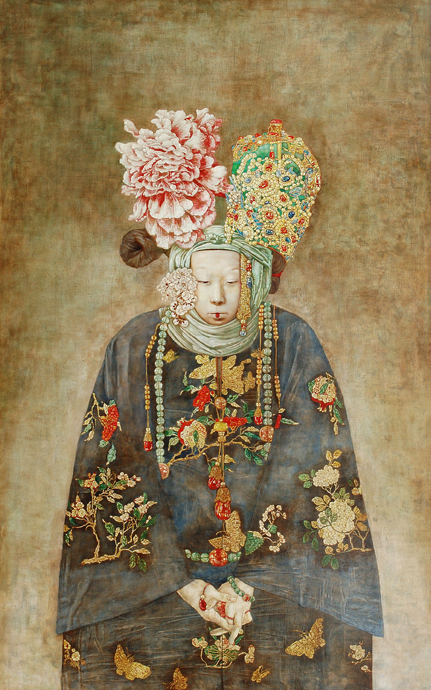 Liu Hong Yuan, an amazing painter with outstanding skills, trained in the best art school in Beijing. She is very much into the tradition of Beijing opera or the Qing dynasty (1644-1911) culture that was dark, splendid, depressing and a little peculiar. Her paintings not only displayed traditional patterns and forms, but interpreted the true, essential and the dark side of the old culture. By applying classic techniques of European oil painting of seldom been seen anywhere in the world today, she painted the first several layers totally in white, building up thickness, then glazed colors making her paintings look as if they were sculptured on the canvas. 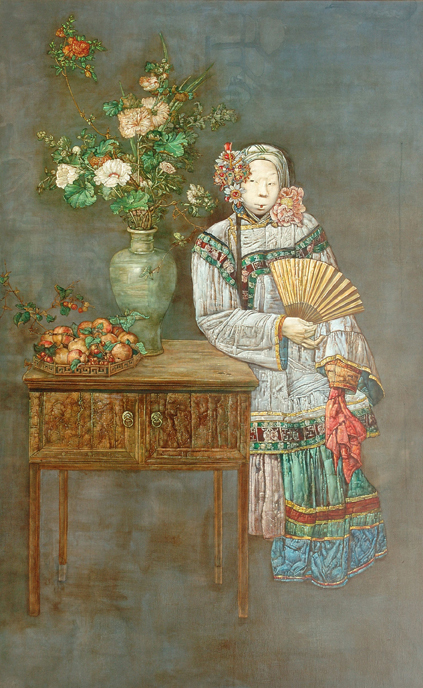 Her enormously detailed works consisted of every jewel worn by her lady, the embroidery patterns of her clothes, the porcelains and fruit blossoms flowers on tables. Her bizarre and classic paintings will always haunt you. oil on silk mixed with linen 74.5 x 47.5"